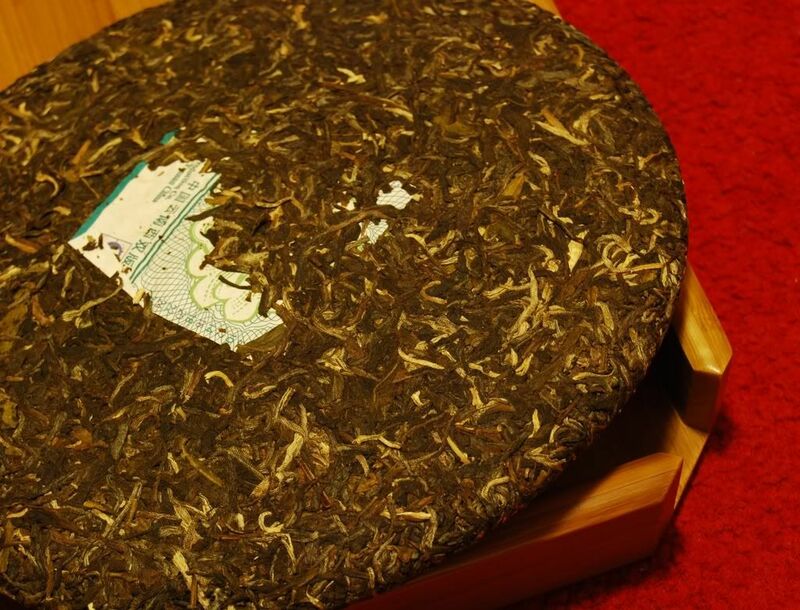 2008 Nada Chayuan "Yiwu Laoshu"
I'm sure that you know my love of personally-selected teas. I freely admit huge bias in favour of cakes made by Real People, not factories. This particular tea is a special one - but I've noticed that I think that about nearly all personally-made teas. All personal cakes are special, but some cakes are more special than others. 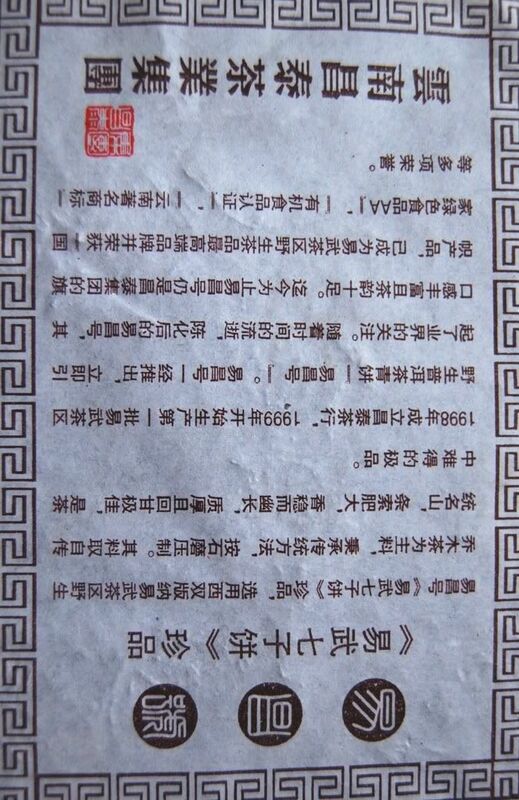 It's a xiaobing, a little cake, and we can see a stamp of the name "Wang Bin" (in red) in the photograph above. 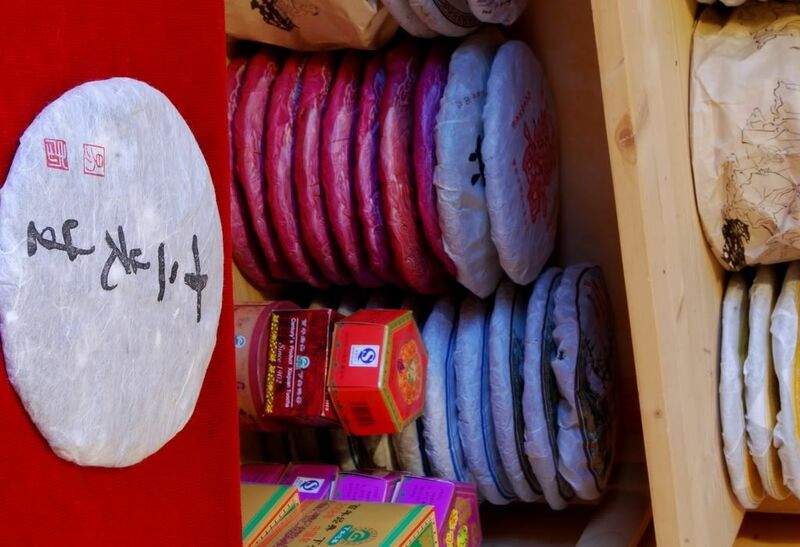 This is the name of the tea-farmer with whom Nada stayed in a previous trip to Yunnan, and who pressed seven of these little cakes in his family-run business. This being one of those seven cakes accounts for my warm feelings towards it. Nada selected the leaves from Yiwu, and tells me that they are genuine non-plantation leaves. Without such personal verification, it's very difficult to know what you're getting in your tea. I'll spare you my regular gripe about China needing "DOC"-style appellations to protect the producers in special areas. Below, a photograph with a regular 375g bing to give you an idea of scale. The compression is just right - firm, but easily separated, giving the cake a pleasing, chubby appearance. I've not yet got to freeing the neifei [inner label], but I assume it says "Nada Chayuan", as does his fine Cha Chan Yi Wei cake. I'm spending more time with the dry leaves these days, as they seem to tell a lot about the tea. 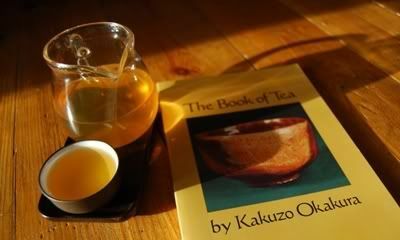 From the strength of the aroma, something of the tea's potency can be gathered. From their sweetness, savoury-ness, floral-ness, something can be gleaned as to the resulting characteristics in the cup. I hope that one day this will come in handy when looking for my own maocha in Yunnan. Time spent wandering tea-filled mountains sounds very appealing to me. Everything from furry tips to twigs and bracken exists in this eclectic mix - I'm a believer in complex maocha, throwing in a bit of everything, as this helps its complexity. 1-D maocha is a bit flat, unless you have some cunning big-factory style processing on your side to perk things up. The aroma is fresh and sweet, and exceedingly pungent - they are like normal leaves, but "more". The soup comes out looking like Chablis, and has the exceptional clarity that one would hope for in an honest, clean tea. 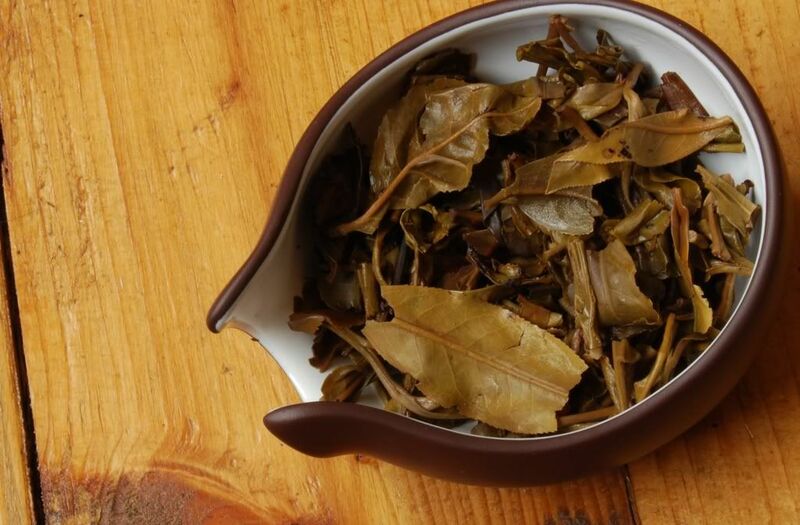 The lengxiang [cooling scent in the aroma cup] is unusually sweet, just like the dry leaves. You can tell from the photograph that it has a little light-brown colouring to it, and this corresponds to that "brown" flavour I sometimes describe - a low savoury tone, complex and complementary to the sweetness. "So soft", says Lei, "It is gentle, with no harshness at all, just like Nada." "More" is a good word to describe this little cake: more of everything. 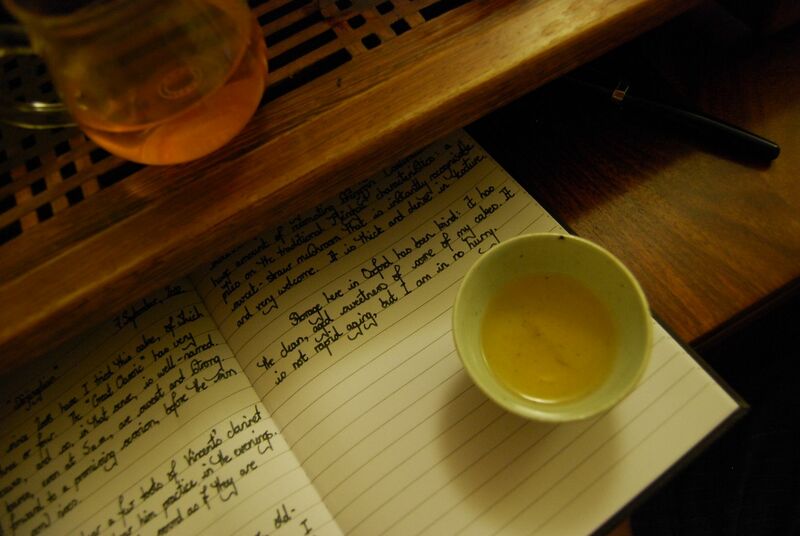 More sweetness, more potency, more complexity, more chaqi. The chaqi is a knock-out. At 10 o'clock in the morning, this tea knocks me sideways - my palms are blotchy red-coloured with warmth, and my head feels sharp and crisp. I imagine Nada selecting the leaves after sampling through Yiwu, discussing the production with Mr. Wang, and I hope he enjoys the result as much as do Lei and I. Since last summer, I've had half-a-dozen fine sessions with this tea, and each has brought a smile to my face. 2008 Yiwu Zhengshan - Douji "Dadou"
What a tiny, weeny fellow this is. Eensy-weensy, in fact, barely larger than a box of safety matches. $5 from Puerh Shop makes it an easy nibble. Douji: sometimes yum, sometimes a bit more ho-hum. Generally reliable, occassionally excellent, and not immensely overpriced. I keep an eye on every Douji production that becomes available via the usual vendors, just in case it's a corker. The leaves are also weeny, and quite fragmented. If I strain, I can make out a very quiet, distant sweetness. Impotent tea? Thankfully not. 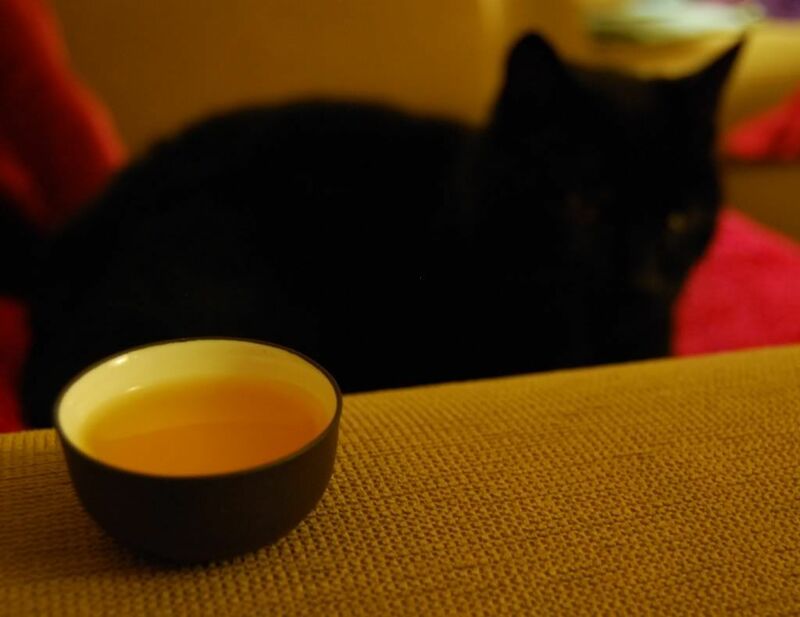 The soup is particularly active, swiftly darkening to orange in the gongdaobei as I watch it. This activity is obvious in the mouth, setting lips and tongue a-tingling. 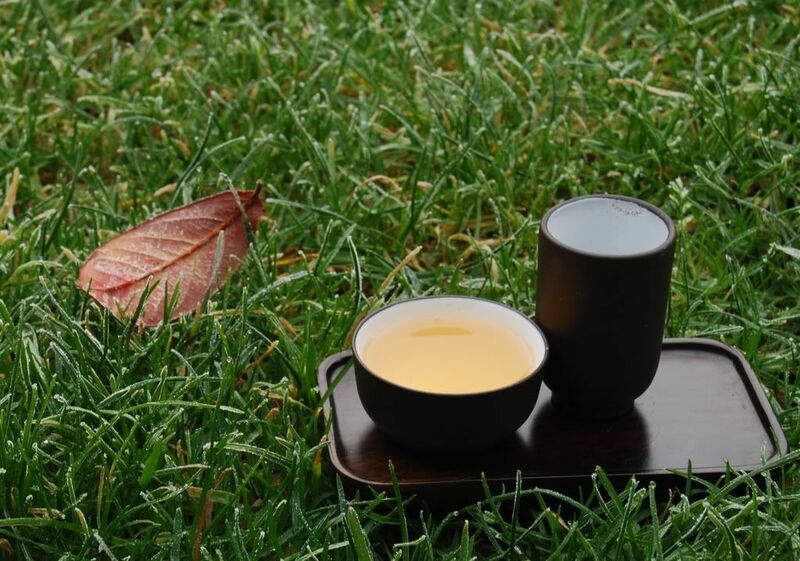 Active tea is a lovely thing - the liveliness gives me the impression of cleanliness, and good growing conditions. It's hard to imagine a mass-produced plant giving such energy. A huigan builds rapidly, in concert with a yunxiang of quick, sweet leather - a sharp scent that darts in and out of the nose without lingering. A tea with some build-up, a crescendo, some sort of sensation in the mouth is a fine thing indeed. Flat teas I cannot abide. Even though conservative with the quantity of leaves, this is a very tasty affair: soft and almost creamy. Long after the tea has gone, the lips remain buzzing, almost aching, in a pleasant way. 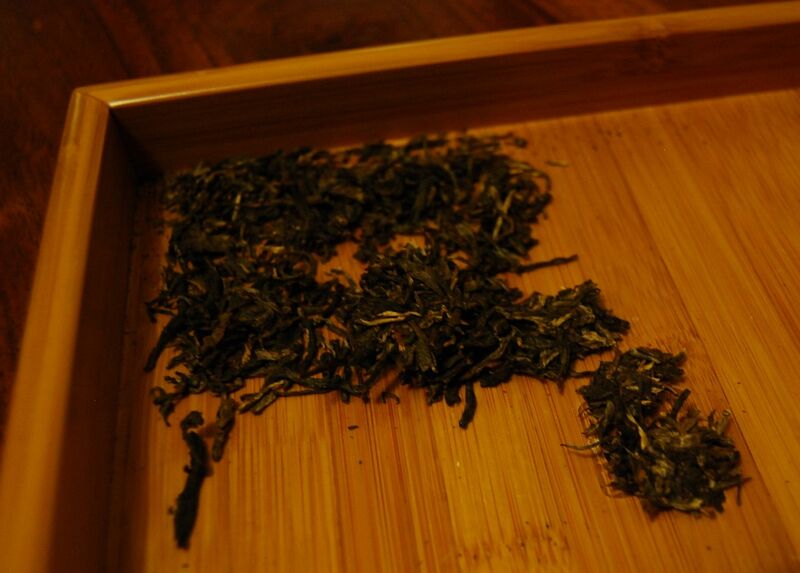 In its flavour, it reminds me of the lovely 2006 Daye Qingbing that I liberated from Maliandao. What a savoury little thing this brick turns out to be, delving into deeper, nuttier flavours. My arms warm up, my palms tingle, and all is well in the world. Signs of physiological addiction? Surely! The leaves turn out to be firm and strong. Grow a plant on too much fertiliser and it tends to be weak, fragile. Grow a plant "slowly", with good soil, and it turns out strong and healthy. 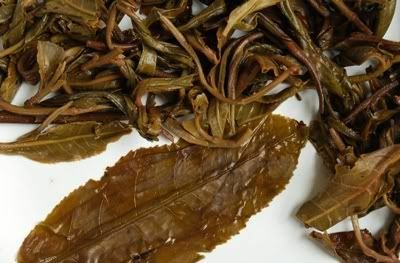 Fine and dandy though the factory teas may be (Menghai, Xiaguan), I've found their 2008 leaves to be thin, easily torn, tending towards being anaemic. In contrast, these are bold and healthy leaves, and they have a little bit more oomph tucked away, ready to give to the brew. I appreciate this little chap - plus, it stores really well, not taking up much in the way of space, being perfectly cuboid and served in packets of six. Each 300g box is thus a wee bit lighter than a bing, and I see myself dipping into my two boxes quite regularly. A fun, lightweight treat that isn't too demanding, and has plenty to give. Dip into one and see for yourself. For Kyoshin, an excerpt on the subject of ice and water. What does it mean to say that illusion and satori are the same? 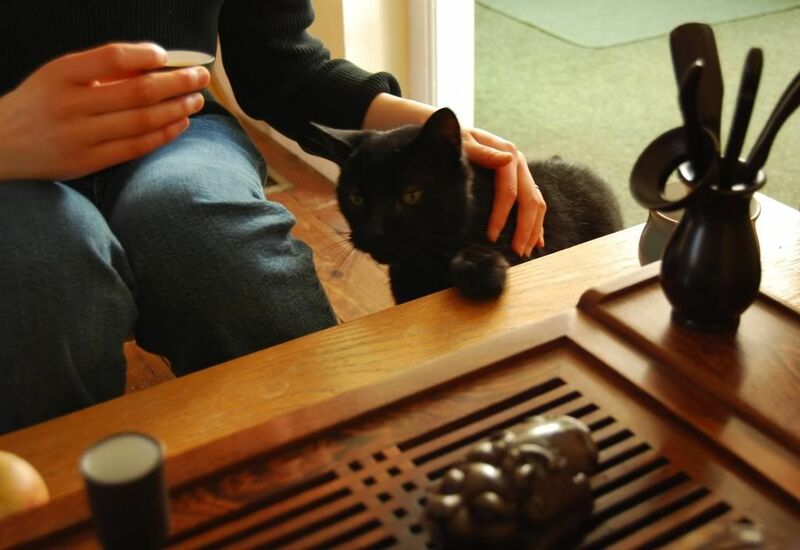 During zazen, illusions arise, go by, evaporate. Westerners always make a distinction between illusion and satori. good on one side, bad on the other. It's not so simple. Good can become bad and vice versa. What is easy does not lead to happiness. Losing one's illusions can lead to a great satori. the relationship is like that between ice and water. and all the illusions melting away produce satori. or any satori at all! This is taken from "Questions to a Zen Master", a book of quotations from Taisen Deshimaru-roshi, who is to European (Soto) Zen what Suzuki-roshi is to American Zen. It a book absent the scholarly musings of other some authors, for example, D.T. Suzuki, and is all the better for it. Deshimaru-roshi is a rebellious Zen spirit, whom I suspect when asked the question, "This must not be called a pitcher of water. What would you call it? ", would kick the pitcher over. It took me some time to come around to being ready for this book, for all its naturalness, directness, and simplicity. 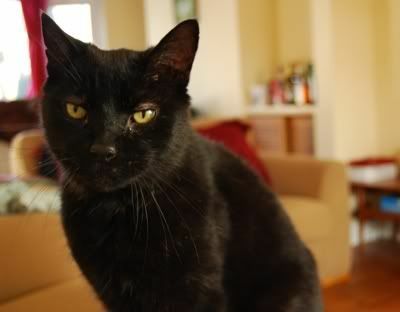 I am the Devourer of Worlds, the Eater of Souls. The dark (somewhat furry) gods are angry and demand sacrifice. 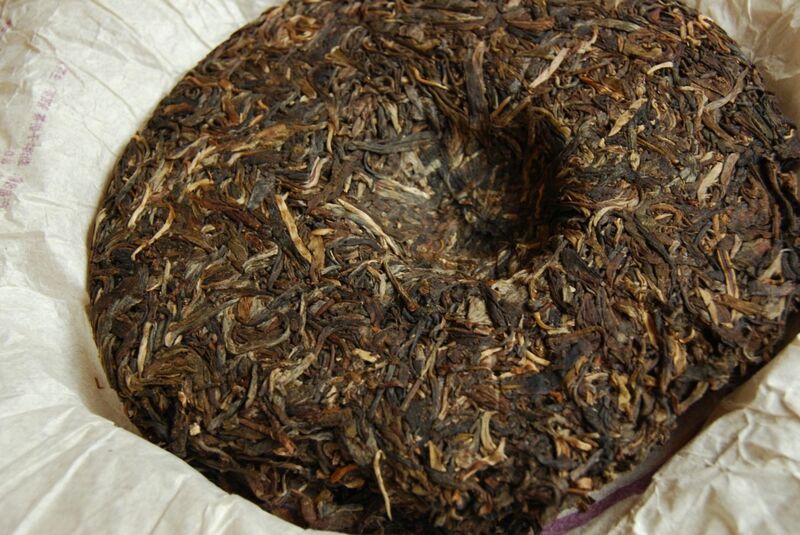 They require tobacco-style shengpu with plentiful energy at an inexpensive price. It's time to break out the 0622-801. I stayed clear of the 0622 in previous years, thinking that it was created to feed the insatiable thirst of the dark gods during the 2006-07 boom. However, it turns out that it's a good recipe after all, showing that the dark gods might know a thing or two about shengpu. It's also a little bigger than a normal sacrifice, weighing in at 400g rather than 357. As its name suggests, it's been going since 2006, and is constructed using baby grade-2 leaves. Looking at the above, you can see that they're rather dainty. 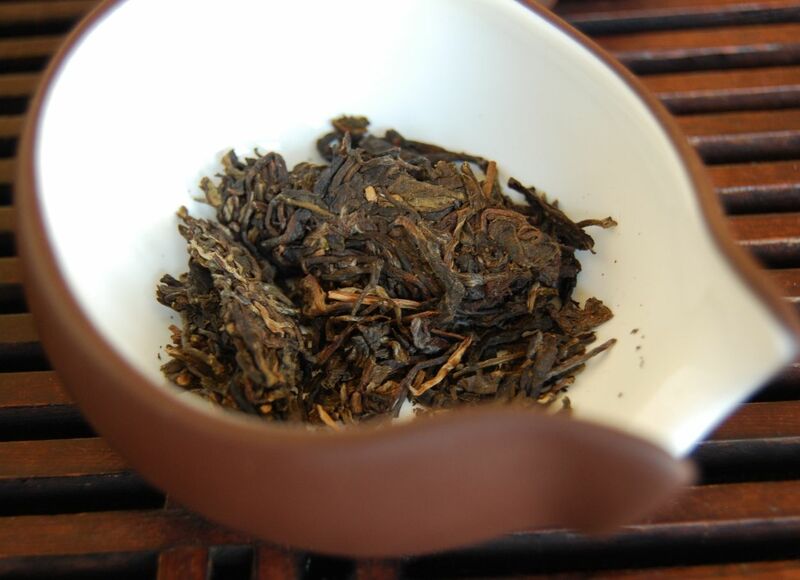 They're also quite dark, which is due to the maocha coming from spring 2006-07. The recipe itself is based on the tarty, zesty 7532 and the 1992 fangcha [square tea], which is one I've never tried before. Given that the 7532 isn't rammed full of tobacco characteristics, and this cake is, I suspect that the 1992 fangcha must be the source of this rather fine addition to the usual Menghai gamut of flavours. The pretty little leaves have a pungent sweetness about them, which lasts forever. Menghai always give you plenty of oomph, which is A Good Thing. The soup, shown below, is just about orange. Something's been changed in this tea in order to get that colour. A few sips of that booming tobacco and it's clear what's happened - but it's a good happening. Plenty of ku [bitterness] has been retained, enabling a beefy huigan, and it has a slick body to it. It reminds me of the higher-end Baoyanesque productions of Xiaguan, such as the Duling Fengsao, and the FT Baoyan mushroom (both of which are exceedingly yum). Every time I think I'm in danger of writing a little too pompously, I read as much of the above book as I can tolerate, and promptly come straight back down to earth. Okakura had many virtues, but a writer of humble prose he was not, which makes this otherwise-classic book quite unpalatable to me. I try to at least sample the major Menghai recipes each year, partly for education, and partly because I find them right tasty. They're blended for stability, according (as is my limited understanding) to a fairly specific recipe, and using a fairly exacting process. Menghai like to call this the "Dayi process" in their product literature, if that has any meaning. 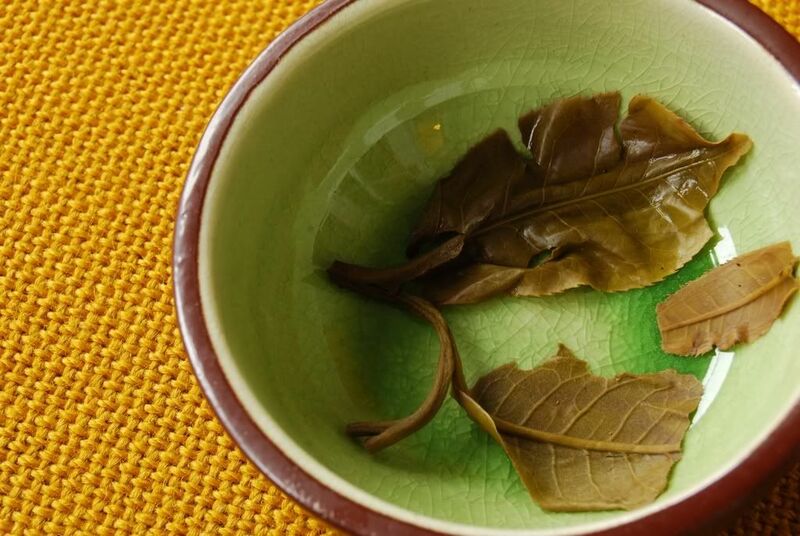 The handy thing about Menghai making tea according to the same recipe and process each year is that it allows a limited amount of comparison to be made between each years' leaves. As far as controlling the infinitely large scope of the variables each year, testing out the major Menghai recipes is about as close as we're ever likely to get to a fair test. It's also quite fun not just to compare the major recipes each year, but also to compare the same recipe from different years. 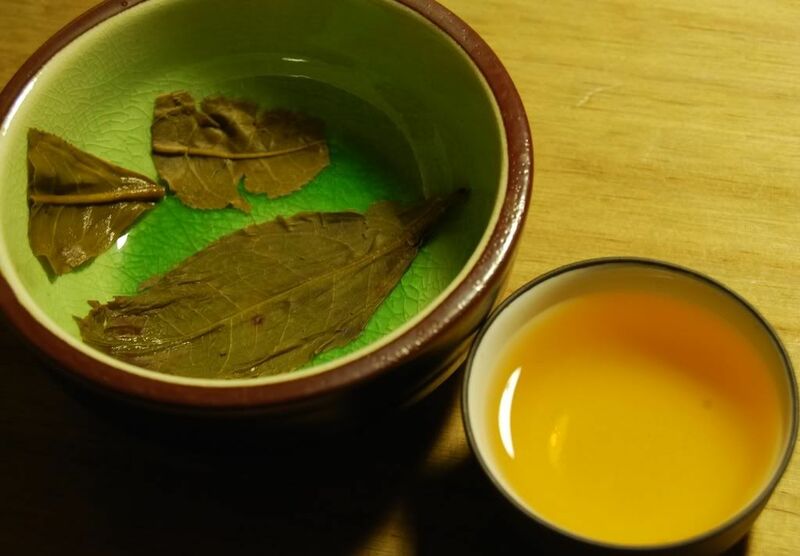 Assuming that the content and production is reasonably similar every time, it allows us some interesting insights into how the nature of young tea changes as it ages, and how the various aroma, flavour, texture, and chaqi components evolve over time. I don't claim to have arrived at any earth-shattering conclusions, but instead mention it as a mere suggestion. As is my constant advice, take everything with a pinch of salt, and find out what all this means to your own palate. Ultimately, I'm just another monkey tapping away on a typewriter, knocking out some notes of my own. I love the price of 7542. Even the "Western price" is nice. Tan recently observed that the Malaysian price is an extraordinarily inexpensive $6 US. Though I bought this for about double that price, I'm happy with it, given my distorted Westernised view of tea prices. 7542 is the butch, ham-fisted, loud-mouthed elder brother of the Menghai family. (I write as a loud-mouthed elder brother myself.) It's aggressive, sharp, and uncompromising when young. It's also one of my favourites. 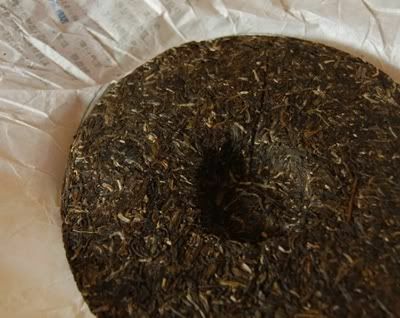 I'm an easy man to please when it comes to pu'er - just give me something with character and I'm well away. As with every Dayi, it's a small cake. Despite being the regulation 2500g / 7 = 357g, it is small. The compression is tight-ish, but it's not a tiebing [iron-pressed cake]. It is dense. There's some matter in these small little cakes. Like every young Dayi cake, this one emits a potent aroma of youthful, spicy "green" on opening the wrapper. 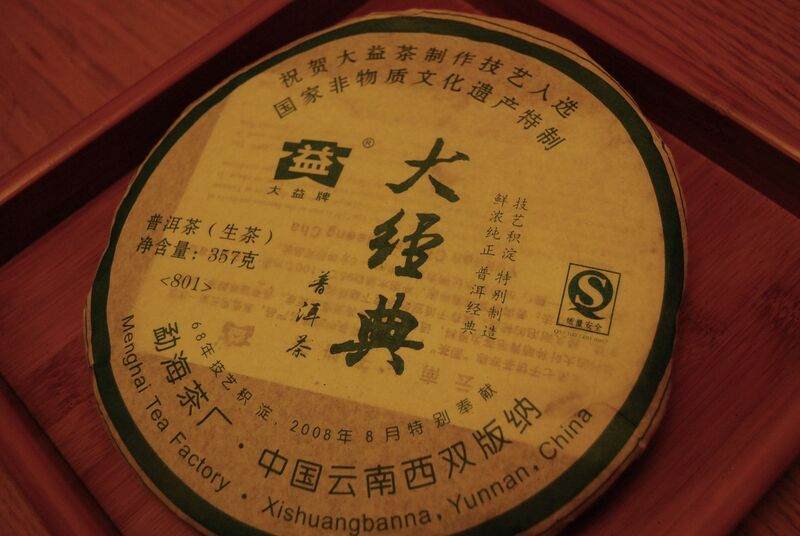 The product page at Yunnan Sourcing, where I bought these, indicates that this was made from 2006 and 2007 maocha. Perhaps you might be able to make out in the above photograph that the leaves are already a touch darker than one might otherwise expect. The soup is dazzling yellow. 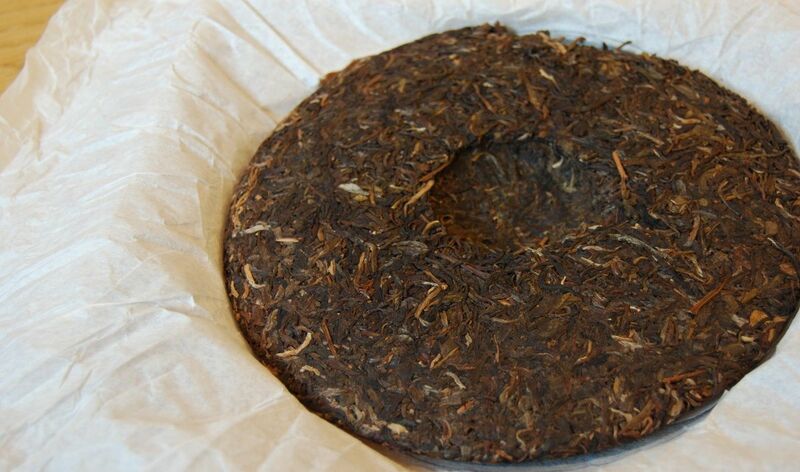 Absolutely nothing has been done to this tea at all, which is quite encouraging, and part of the reason that this cake is traditionally considered "good for aging". 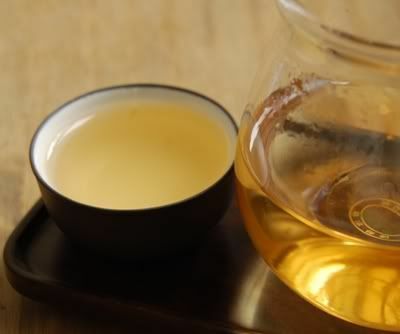 Potency is what the 7542 is all about, and this is obvious even from the wenxiangbei [aroma cup], in which sugary Menghai scents are delivered with all the punch for which this tea is famed. In the mouth, the vibrancy on the tongue and lips is the first sensation to grab the attention, rapidly followed by tons of patented Menghai mushroom-and-straw. One session with this tea at 5 a.m. resulted in me being wide awake by 5.01 a.m. Marvellous stuff. It rings in the mouth, bitterness piling in at the end to create a significant huigan. 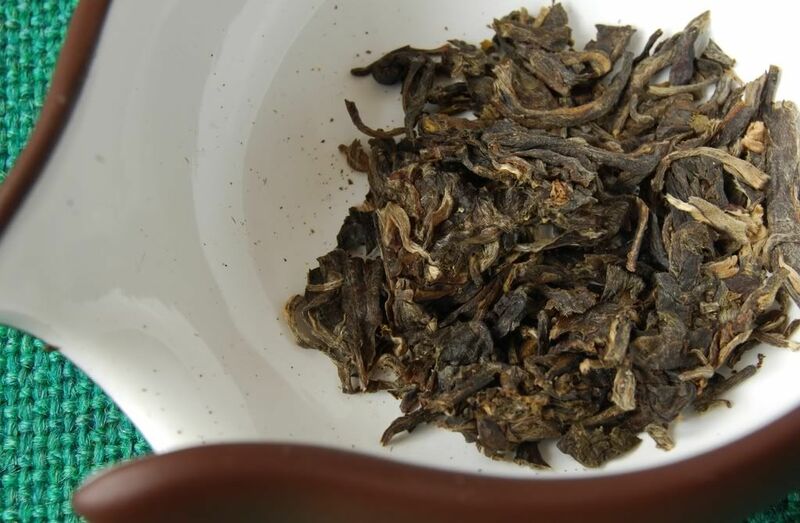 Unlike lighter Menghai blends, this has that depth and low flavour that a fanciful imagination could easily extrapolate into becoming the dense, bass flavour beloved of older 7542. 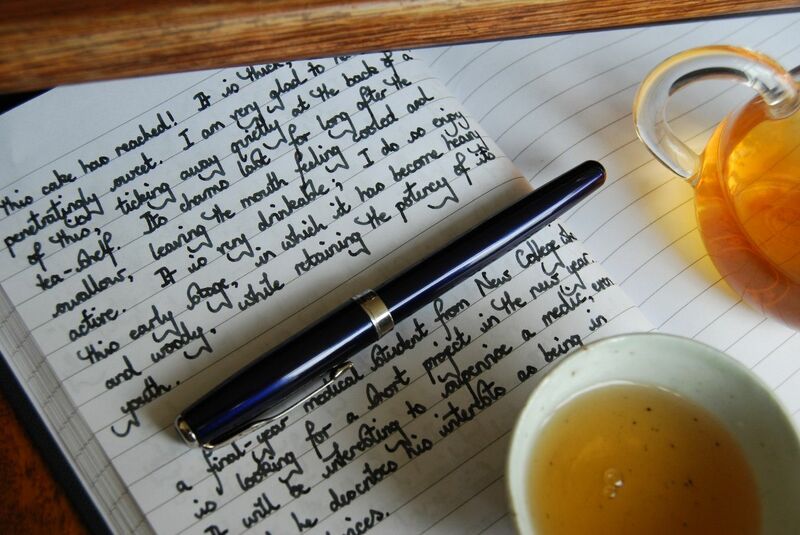 After a few cups, the chaqi is lightly dizzying; after a whole session, I could run a mile - even in English weather. Though I don't want to wax lyrical about a blend that is a real stalwart each year, a bastion of dependability, I can't help but love this Old Faithful. Every year, it reinvents itself anew in my affections. 2008 was a good year for Menghai. It has darkened during five years, as you might be able to tell from the image below. I have the advantage of clearly remembering this cake as it was in 2008, and so it is heartening to see some changes have occurred. This is strong tea. I was cautious, leaving some of the leaves in the chahe (char-her, pictured below). This has sweetness, and has a long huigan that I did not expect, after remembering the robust potency of the original. Some of my cakes taste humid, some taste "dry" - this is more towards the latter. 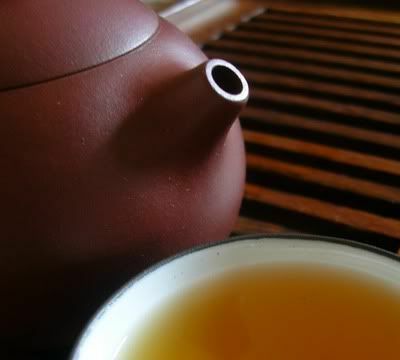 It has the dark, long sweetness of comforting Dayi, but is definitely not "dark Asian tea". Perhaps that should be expected, given its environment. 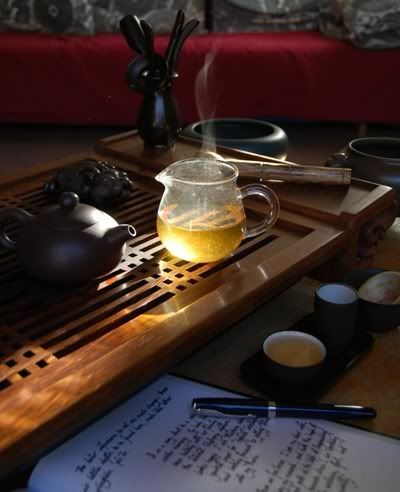 Davelcorp wrote a few years back, "Tea fulfils the need for ritual in my life." I've been thinking about ritual, tea, and whatnot. On Wednesday nights, I run down the street in a long, black robe, invariably late for Zen practice. On Sunday mornings, I run down the same street in a different black robe, invariably late for High Mass. There's a lot of ritual in my life, including tea ritual. How much of it is useful? What on earth does it mean anyway? The university here is old, and it's always been packed with the strange rituals that you'd expect to accumulate over long periods of time. It dates back to a little after the Norman conquest of England, some time around 1090 a.d., and has always been a religious institution - it's primary function for the majority of existence was to train clergy for a life of service to the Church. Up until the Reformation in 1536, that meant the Roman Catholic church. After that, it meant the national church, the Church of England (a.k.a. "the Episcopal Church" in the U.S.A.). 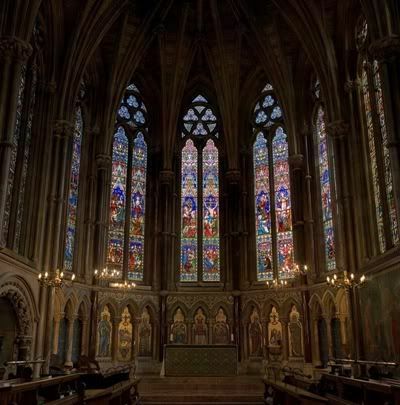 In fact, up until 1880, you could only join the university if you were a communicant of the Church of England, and had to swear an oath of allegiance on the Book of Common Prayer during matriculation. It's still illegal for the Queen to marry a Roman Catholic, which seems rather at odds with our supposedly egalitarian and ecumenical society. 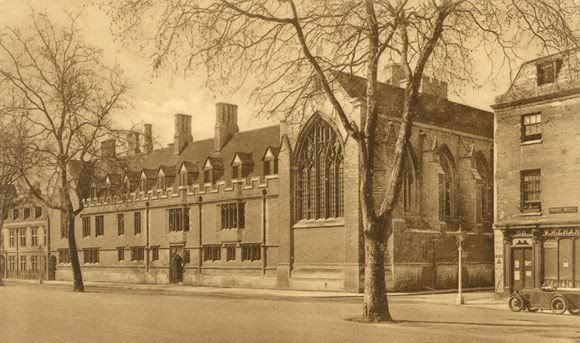 Every year, a sizeable proportion of the new intake of Freshers end up at some chapel or other. There's a lot of ritual to learn, as the university tends to be a bit more rigorous than we'd typically see at school. Bow here, kneel there, nod there. Sing in Latin (unigenite does not rhyme with anything), sing in Greek. It's all very confusing to the newcomer - I remember it well, being in the same situation and behaving the same way, and I recognise the familiar expression of mild confusion and determination on the faces of every new student. Everyone learns the ritual, but how many students finds out what that ritual means? If it has no meaning, why are we doing it? Some of the good chaplains teach the meaning of the ritual to the new students, but most are left to pick it up themselves. Being a stubborn type, not given to expending effort without reason, I try to learn the meanings of these things. If I'm supposed to be down on one knee as I first approach the altar at High Mass, I want to know why. If I'm supposed to sit in zazen with my left hand uppermost and my right hand lowermost, thumbs touching, I want to know why. If I'm pouring tea into an aroma cup before the tasting cup, it's got to be for a reason. Each part of the ritual in the High Mass, and in zazen, is an expression of something on the inside. If we bow at the altar in High Mass, it's to express respect and adoration for something that we respect and adore (in the literal sense). If we have our thumbs touching in zazen, it's so that we can ensure a state of mindfulness. If we pour tea into a tall thin cup to smell the aroma, it's because the aroma can more easily be ascertained from something with that shape and evaporative quality. This (eventually) brings me to the point of all this verbosity: blindly following ritual without questioning it is dangerous. At Mass, the Freshers are learning the ritual to fit in. They don't want to look as if they don't know what they're doing. They want acceptance. At zazen, it's the same. In performing gongfucha, it's the same. I did this; maybe you did, too. We assume that the ritual is right because we have imbued the people that are telling us about it with some kind of authority, whether or not that authority is deserved, or justified. 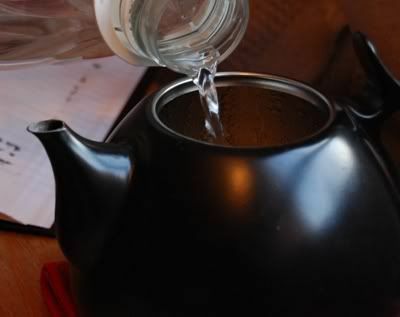 I remember reading a tea web-site that told me the optimal brewing time was the time taken for the water to evaporate from the outside of the teapot. Without questioning it, I brewed tea like that for a week or so. My tea tasted awful. I pushed on, because I had unconsciously given that tea web-site some authority in my mind - they couldn't be wrong, they'd been writing for ages! Weeks later, I finally questioned it, varied the parameters according to my own observation, and got some better brews. It happened all the time. I would go from one seemingly authorative web-site to another, picking up ritual quite blindly, trying to find out the "right way" to perform gongfucha. I had to have certain shapes of teapot for every micro-variety of tea. I had to use X grams of leaf for Y millilitres of water. I had to use water heated to Z degrees. Surely, these authorities knew the "right way" for gongfucha, and I had to learn it. After many weeks, I started to drop these bad habits, as I began to question more and more the authority that I had given these sources. That's not to say that they were wrong, but simply that I was taking them far too literally, and simply trying to find that "right way". There is no "right way". Not in gongfucha, not in High Mass, not in zazen, not in writing that essay, not in validating that theorem, not in making par on that tricky 18th hole. Doing it wrong is very beneficial, oddly enough, because it enables us to find out better ways of doing it ourselves. In Zen, it is said that "delusion is valuable, it is like ice - the more delusion we have, the more obvious the effect when it is melted." 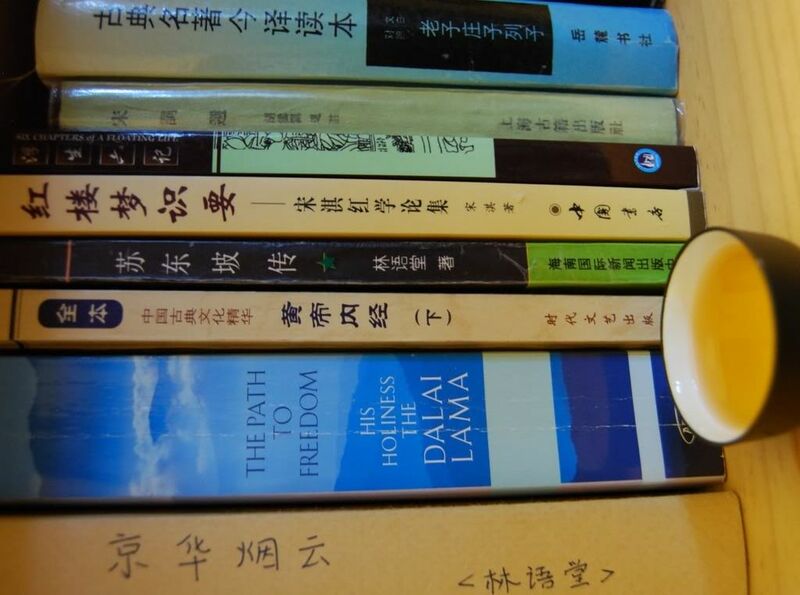 The more howlingly bad our tea is when we follow some authority's "right way", the more obvious it is when we find that particular method that works for us. Zen monks approved to teach do not say, "Listen to me, I can make you achieve state XYZ." Priests in chapel do not say, "I can make you feel the presence of God." The golf coach does not say, "Follow my words and you'll hit a hole-in-one." The professor does not say, "I will describe to you how to create a new important theory." 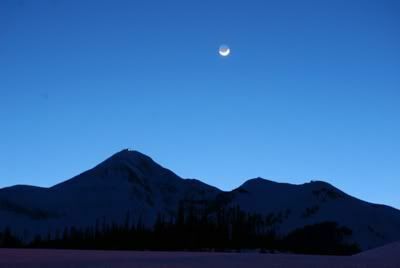 They are just fingers pointing at the moon, signposts to a goal which we can only reach on our own. They may have reached that goal themselves, and so their opinions may be worth heeding - but these are just opinions. There is no right way - not to God, not to making par, not to making a decent brew. So, just make tea. Make lots and lots and lots of tea, and find out what's best for you. Your tastes will change as you drink more, and so your method will change to suit those tastes. Who can tell you how to make that perfect cup? Next time you read an article about making the tea leaves rotate anticlockwise, or how your teapot has to be egg-shaped, or how your kettle has to be constructed and heated, remember - these are just opinions. These are opinions being reported by people who have found out what works for them. They're not the "right way". I've been getting back to the classic producers recently - though there have been some good counter-examples from new factories. 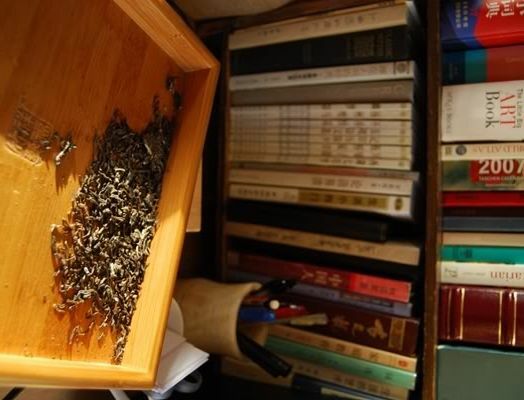 As part of my re-acquaintance with Menghai, today's article on the 2008 "Great Classic". I can't remember where I read about this one, but I bought it on the recommendation of a post somewhere! I was after something a little more unusual that the benchmark, numbered blends, and this cake fit the bill. 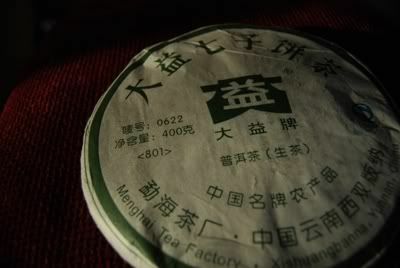 Menghai claim that it was made in order to commemorate the selection of the Dayi brand as "national cultural heritage". Amusing though the notion of being awarded a label of heritage may be, it's applicable enough in this case. Something inside me winces whenever the Chinese government discusses heritage, given its previous stance to "the four olds" (a list that includes customs and culture), but at least they appear to be on the right track lately. 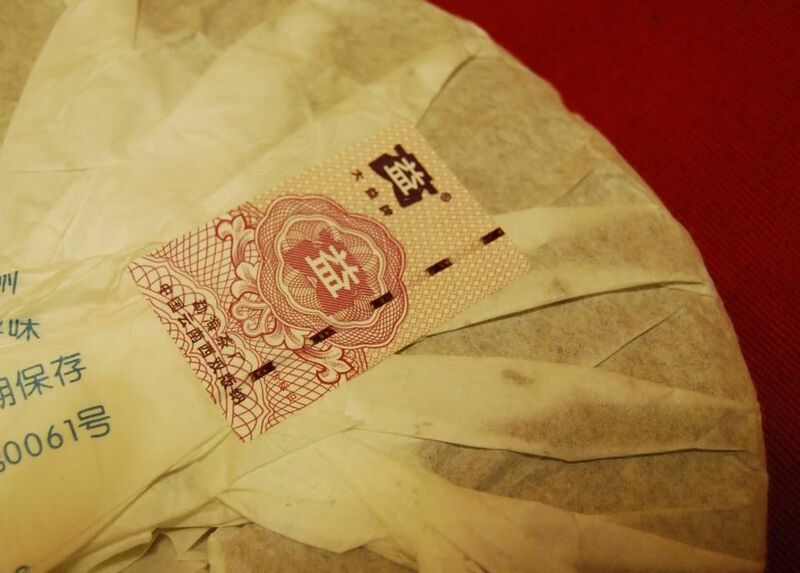 As I'm sure you know, Menghai have started using seals to close the backs of their wrappers these days (pictured below). These things are a pain, as it becomes very easy to tear the paper. Once the security measures are carefully circumnavigated, the bing (below) is attractive: solid in compression with a homogenous blend of small leaves, which are around "grade 3". Menghai cakes look and feel hearty - and they're easy to separate without being too loose. Opening the wrapper throws an aggressive scent of young, green leaves into the far corners of the room, beneath which is a slower undercurrent of deep sweetness that suggests this cake has much to give. 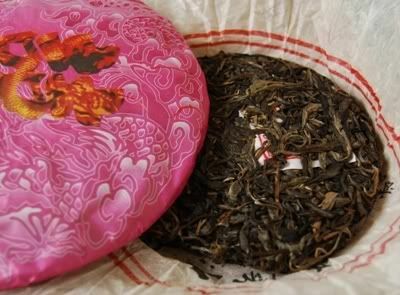 The leaves are quite dark for a 2008, and the description tells us that they are "semi-aged", presumably meaning that older maocha was used. Pictured below, with our constant calorific companion, the yellow-orange soup that turns deeper orange as it contacts the air. It does so quite rapidly, giving the impression of being active. 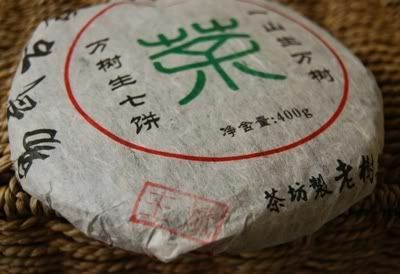 The kougan [mouth-feel] is thick indeed, as noted in the product description, and it has a rich mushroom character that reminds me of classic Menghai cakes. A rapid huigan [sweet aftertaste] builds quickly, in concert with an aroma of wild flowers in the nose: sweet, rough, floral. Beneath it all, the bedrock of sweetness that holds my attention. This is a solid, complex little tea. Menghai have a habit of being able to produce good things at a low cost, making them very hard to beat, and keeping the industry's feet on the ground. 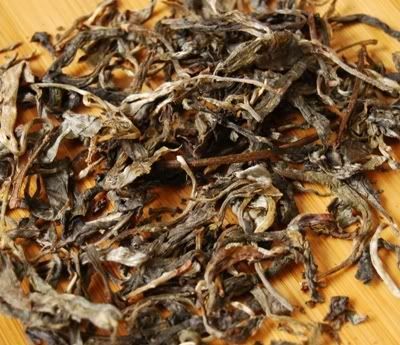 It has plenty of potency, and running from the dry leaf to the final sip, that mushroom Menghai sweetness that continues to please. I've added a few more of these cakes to our shelves to see how they do - they've got quite a bit of content, and some good legs, so we'll see what happens. However, given the enjoyment I had from these tasting sessions, they might not last too long. I bought these cakes for around $10-15 in 2008, and have not tried them since. The price was higher than the Taobao equivalent as I bought them from Yunnan Sourcing. The current Taobao price is around 100-150 RMB, which approximately represents a doubling in the past five years. They are, however, inexpensive to this day. Scott of YS sells this for around $30. My stacks do have a good scent, which is encouraging. The leaves, always small and dark, have become darker, as shown below. 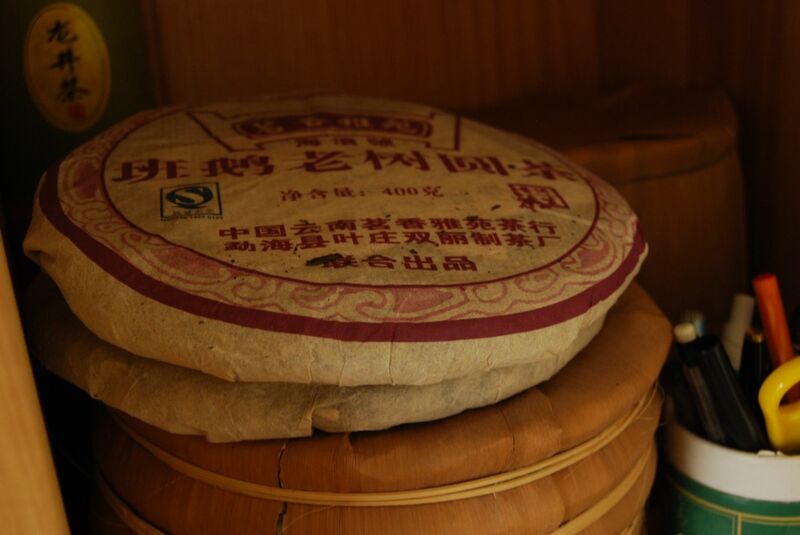 The scent in the wenxiangbei [aroma cup] is the huge, old-fashioned aroma of Menghai mushroom, which lasts forever. I am reminded of the reliable quality of this old brand - even its fairly basic cakes, such as this. The blend is quite proper, and has a deep, dense sweetness with a lovely kuwei [good bitterness]. I appreciate its resonating shengjin [mouth-watering]. Sweet straw, mushrooms - it is instantly recognisable and very welcome. Its texture retains the thickness of its youth. Storage here in Oxford has been kind: it has the clean, aged sweetness of some of my older cakes. It is not aging rapidly, but I am in no hurry. Overtones of an old cake are beginning to show, but it is challenging and charming in its current form. The power of its youth, which I somehow remember after five years, has consolidated into this density of sweetness. It is only Dayi, but it is so definitely "classical" that I am enthralled. It tastes just like old tea, young. This is a tea with a big billing. I bought it from Yunnan Sourcing, where the product notes read that this is the "most premium" Hailanghao production since the famous 2006 Laobanzhang. I loved that tea, but missed out on buying it, and AL was kind enough to provide me with a much-valued sample. I am determined not to let this one pass similarly! It's more seriously priced, being over $50, which makes it comparable to prices reached by some premium labels. It's a definite increment for Hailanghao, which are usually much less if you buy them during their production year. Is it worth it? 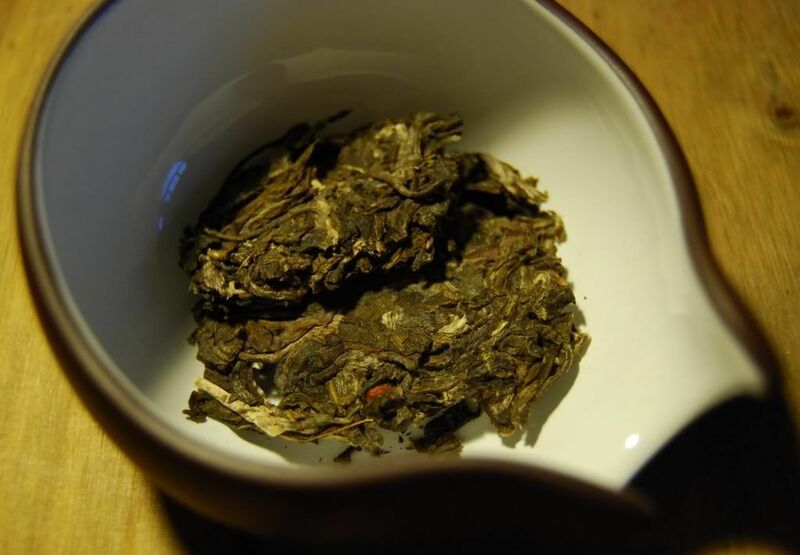 Shown above, the leaves are quite dark and small, but it is the aroma that arrests the attention: long, Banzhang sweetness with a solid base of tobacco makes me a happy drinker. 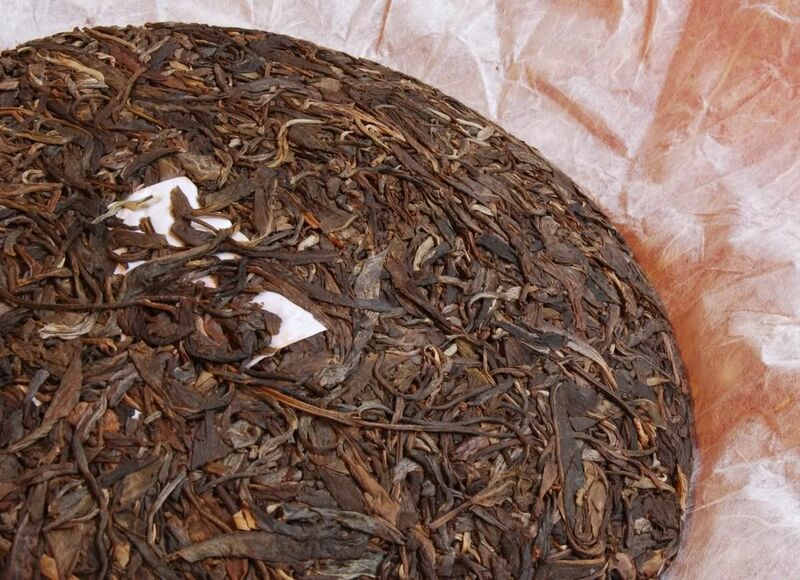 In the wenxiangbei [aroma cup], sweet tobacco leading into a candy finish - excellent stuff. The flavour opens with tons of tobacco, and then proceeds to become yet stronger in tobacco as it moves to the back of the mouth. In the throat, a mouth-watering huigan [sweet aftertaste] and plenty of challenge. Happily, the soup is thick and heavy, and heading towards orange, as shown below, along with Haidu [black belly], our fat feline friend. What a lovely production this is. It has plenty of bitterness to keep you on your toes, but which can be controlled easily and which only complements the flavour, inducing that strong huigan. The chaqi is soothing, and I feel at ease, but simultaneously brightened. As the infusions march on, I am left feeling very positive. Happily, diplomatic negotiations result in my securing wifely agreement to buy a tong of this tasty shengpu. I'm looking forward to enjoying more sessions with this tea, as it's right up my street. Is it worth 3 cakes of good 2008 Dayi? That's up to you. My solution - buy them all! I bought a tong of this, back in 2009, and have left it for the last two-and-a-half years. It has come on quite well, and shows tons of potency. The leaves are particularly beautiful, being fragrent and sweet. The soup is a solid, husky orange with a huge aroma of smokiness, which then becomes fruity, and, finally, filled with orthodox sweetness. It is big, bitter, longlasting, and tangy. "Far too bitter for me", noting my dear wife. "Too big to fail", I wrote in my diary, given its hugeness and uncompromising nature. Is it aging? It has become lower and heavier, decreasing in brassy kuwei and filling out its dense, powerful base. It becomes sour. I have the tong pictured above, priced at around $50 per cake. I cannot imagine buying anything else from Hailanghao, given the (really very silly) modern prices, but they combined stability, strength, and decent value back in 2008. The leaves are surprisingly whole and large, with a quietly sweet scent. There is absolutely nothing quiet about the soup, however. 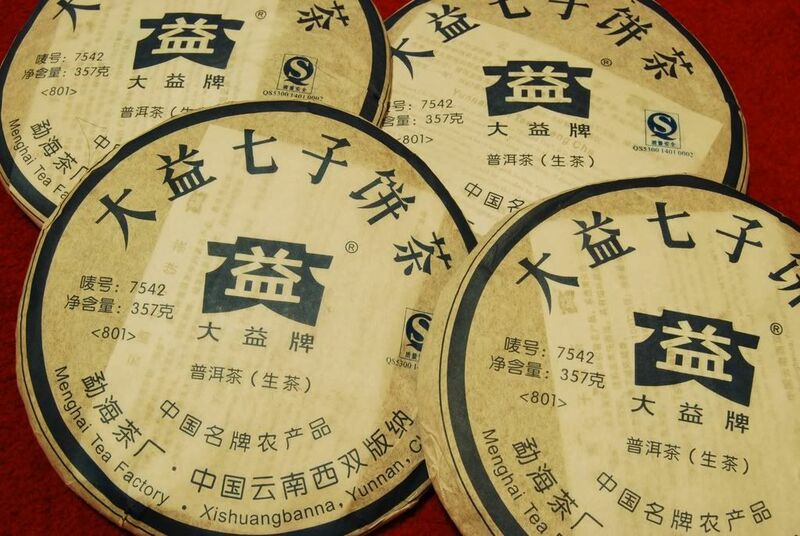 The wenxiangbei [aroma cup] is filled with a strong sweetness, which endures very well. 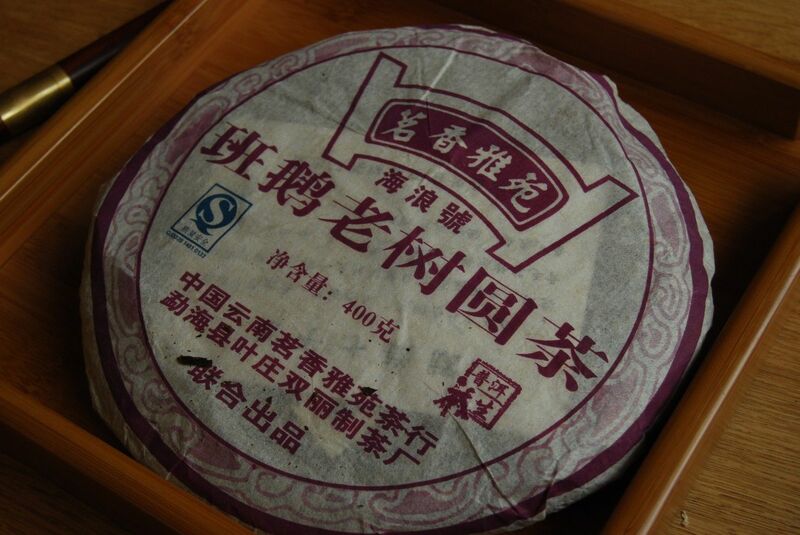 It is clean, low, and transforms itself into a lengxiang [cooling scent] of sticky caramel - much as I remember it. The good news is that this cake is strong. The bad news is that this cake is still really very strong indeed! It is thick, broad, and penetratingly sweet. It charms last long after the swallow, leaving the mouth feeling cooled and active. It is very drinkable, surprisingly; I rather enjoy this early stage, in which it has become heavy and woody while retaining the potency of its youth. The bitterness builds with passing infusions, and I chastise myself for being a little too free with the quantity of leaves that I brew. Infused carefully (i.e., extremely rapidly), it remains sweet and pleasant in later infusions. It is well-balanced, and worth $50 of anyone's hard-earned currency, I'd say. This cake is coming along well. It remains bitter, but is aging properly, and has deepened in both colour and character. This is well worth keeping an eye on. It's a bit of an epic cake today. Cue dramatic music. We've had this cake since last summer, kindly bought for us by proxy by a travelling chum (mille grazie!). In the grand scale of things, it was quite expensive (to me, at least) - the 2007 version that I loved so much was a great deal less costly, allowing us to buy a tong. This 2006, though, is represented by just a single cake - so I'm making it last. I've recently seen this one for sale at Nadacha (disclaimer: friend of mine, and of many others! ), and I imagine that the continuing link 'twixt Andao and the 12 Gentlemen might allow it also to be bought there. Unlike the 2007, which you might remember was compressed very tightly, almost Xiaguan-style, this is a more easy-going affair. I think I prefer it this way, as the air gets to the leaves a little more, and it's much easier to take out leaves without damaging them. I remember chipping away at the 2007 and making some rather bitter brews. Throughout the cake, the blend is constant. I can't remember where I saw the photographs of the 12 Gentlemen's shop, but it was a very scientific affair: libraries of teas were arranged in little boxes according to processing, blend, age, etc. If I were producing bingcha, I suspect I'd take a similar approach, experimenting with variables, trying to optimise the blend. It's nice to see that someone analytical is trying the same thing, and it gives me some unfounded, irrational confidence in the outcome. Certainly, there's a great art to making tea - but I don't discount the science part either, and I bet that the two are complementary. 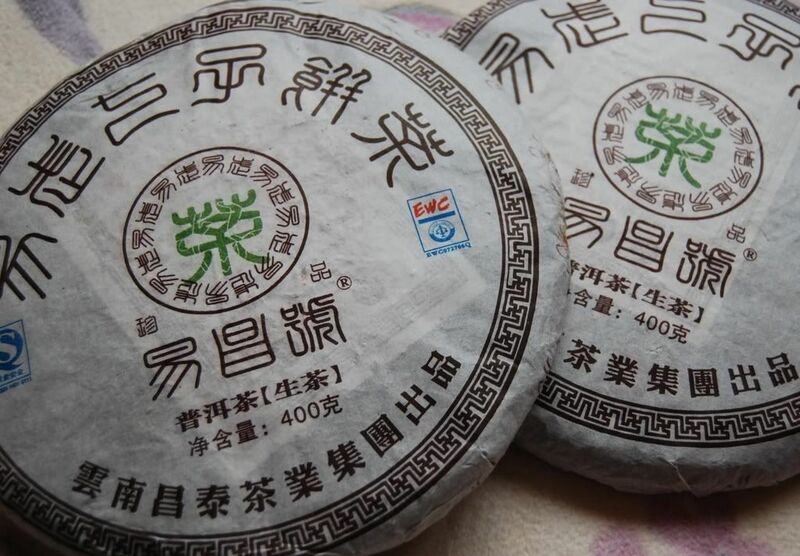 I've tasted some "pure art" pu'er (in the sense that the aesthetics are given priority), as I'm sure we all have, and they can be a bit flat or one-dimensional. 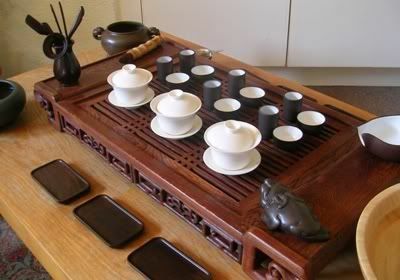 I want someone in control of the process and its various effects to make my pu'er! Pictured above, the pretty leaves that I took downstairs to our tea-tray. They're dark! Small- and medium-sized leaves are mixed with similarly-sized fragments of larger leaves, with a healthy selection of stalks included. 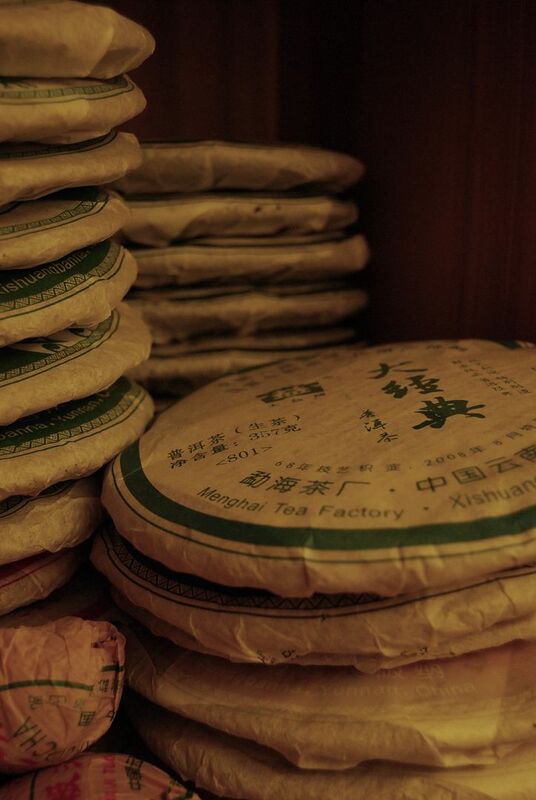 In the chahe [tea-lotus], solid scents of sweetness and leather - it must be Yiwu, and a good one at that. The density of the aroma is impressive, which bodes well. As you can see below, the soup is yellow-orange, which looks honest enough. The tea is complex: the beidixiang [cup-bottom scent, initial aroma] is active, but low - the low sweetness of cooking grain, or roasted sweet potatoes. That low sweetness then shifts into a lengxiang [cold-scent] of more spicy sweetness, similar to cooking raisins. 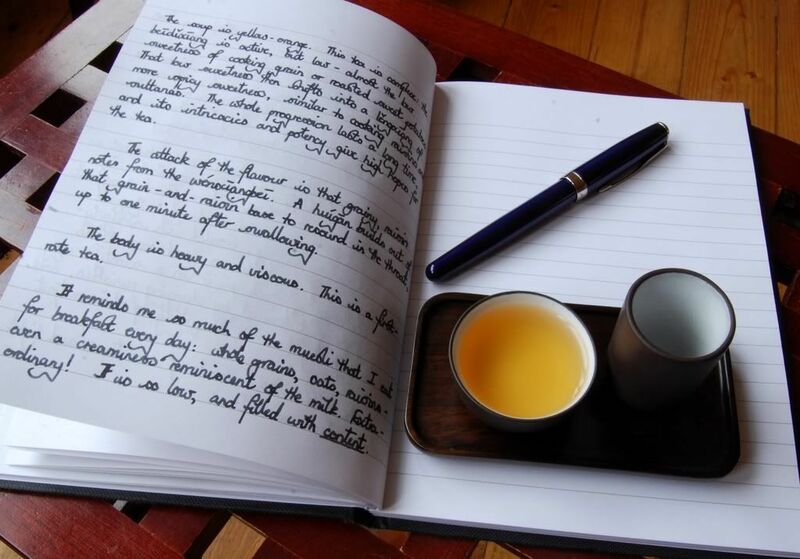 The whole progression lasts a long time, and its intricacies and potency give me hope for the tea. There's a lot going on in this! 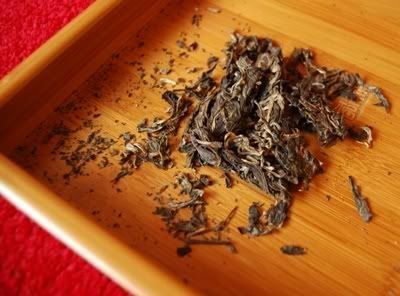 The attack of the flavour is more of that grainy, raisin-like character from the wenxiangbei [aroma cup], out of which a huigan [return-sweet, aftertaste] builds until it resounds in the throat. This lasts as long as a minute after swallowing, which is fairly unusual and very welcome. Already wooed by this tea, I enjoy its heavy and viscous body. It is filled with plenty of real content, which is what I'm after. It is antithetical to the watery, thin soup from more ordinary fare. Not only is this a tea with plenty of content, but it is a tea in which that content evolves noticeably from infusion to infusion. As the leaves open, a clear cooling sensation appears on my tongue, while a mushroom flavour develops. As infusions pass, this mushroom gradually evolves into something more wood-like. After the ninth infusion, we enter simple leafy sweetness, but potency remains. 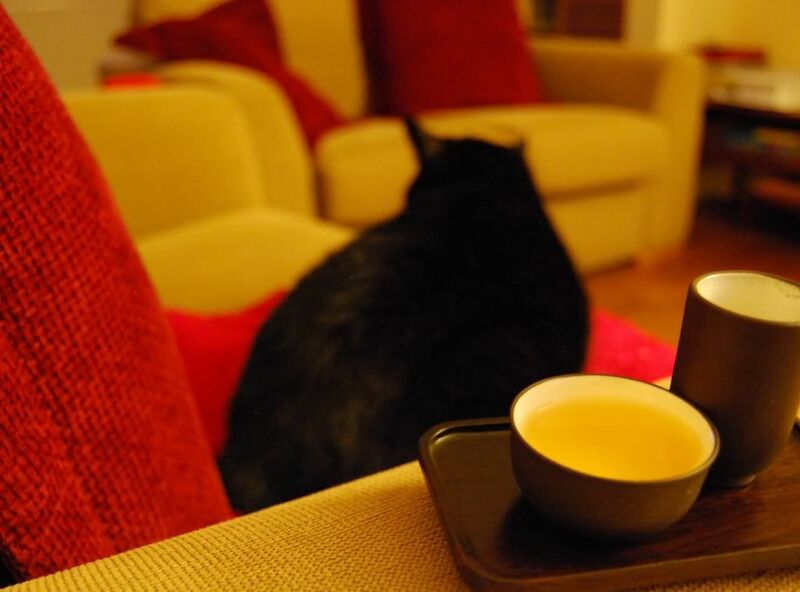 This is a tea that rewards attention, and it's a very enjoyable journey from start to finish. Definitely one to try, if not to buy. What a difference two years makes! This cake has settled into a straw-like, citric feeling, not unlike the genre of my old favourite, the 2006 Xingshunxiang. Tart, smooth, but hollow in the middle. This one definitely needs more time. I found myself awake at 4 a.m., my head filled with various academic plans; being an academic is a burning, all-consuming task and I occasionally find myself writing down 17-page ideas in the dark hours before the dawn, at the tea-table. 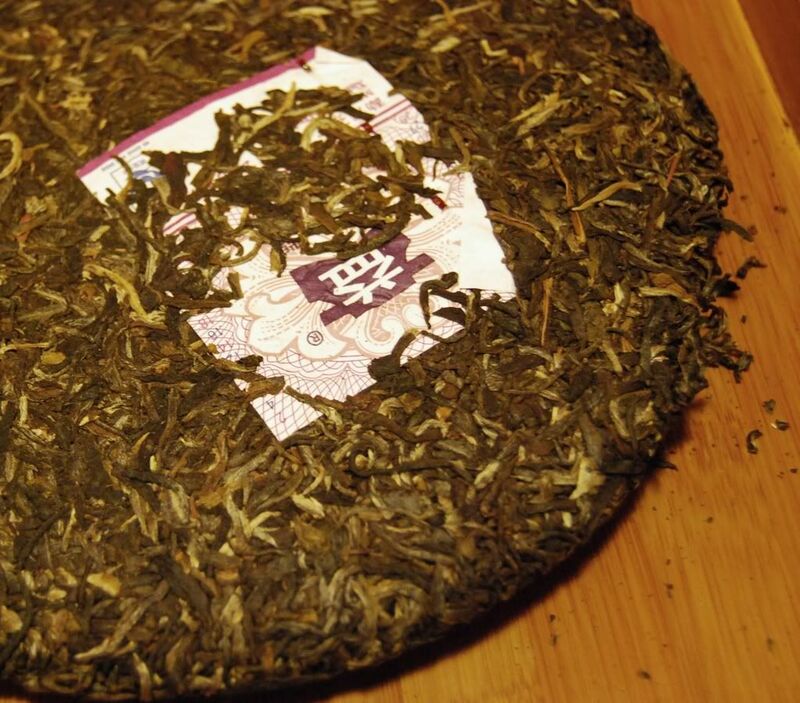 At Shah's behest, I decided to dig out the 2006 Yiwu cake from "12G". (i) I have way, way too much tea. In attempting to find this cake, I went through four shelves filled with tea. I found tongs of which I have absolutely no recollection; they are encouragingly marked with dates from the early 2000s, and, in one case, 1997. I conclude that I should dig into these, and reacquaint myself with these mystery purchases from the last decade or so. 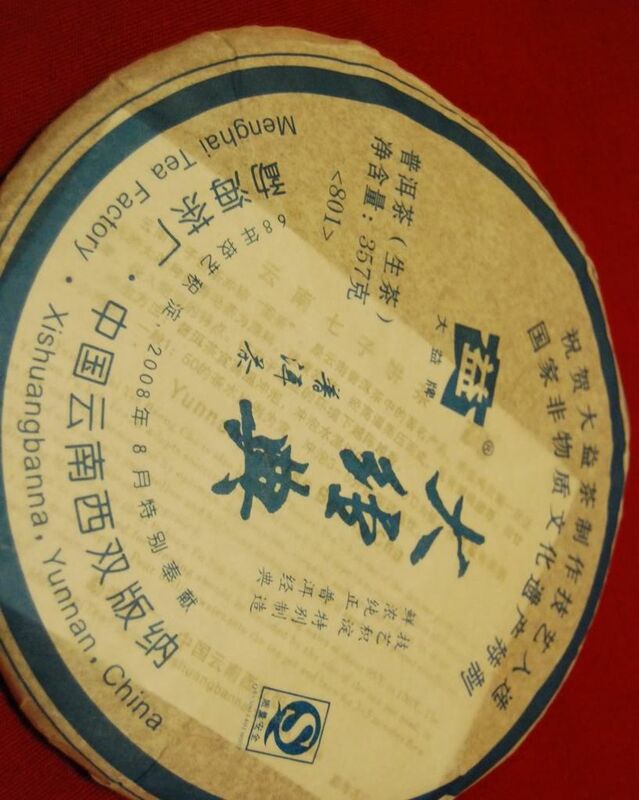 (ii) This 2006 Yiwu tea is now very tasty. 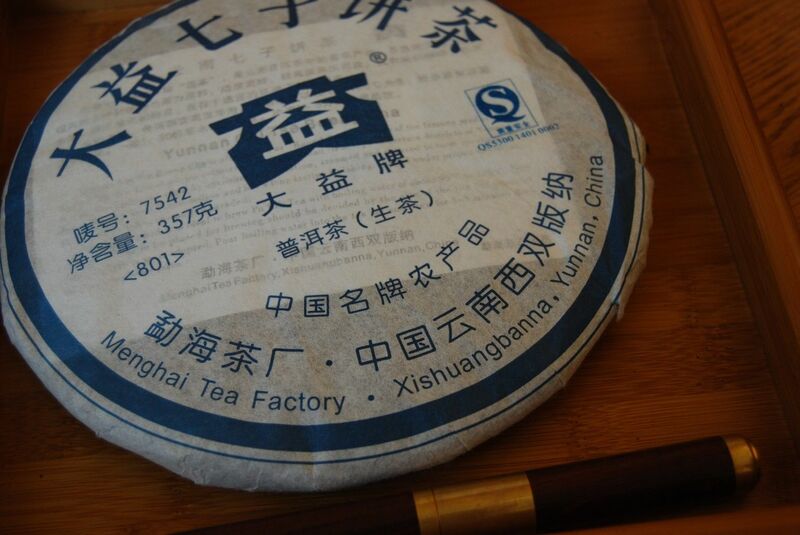 It has been getting the humidity it needs, by the taste of it, and has developed into a long, densely-sweet Yiwu character in the classic manner. This is further aided by a rich and satisfying background of dark tobacco (without the smokiness), which is a complex flavour that keeps my interest. It has plenty of strength, but the bitterness now dwells at the back and in the swallow, rather than dominating throughout. The foreground bitterness has become a chunky and irrepressible sweetness that I can taste even now, writing these notes after the session has finished. 2007 Changtai - Yichanghao "Yiwu"
Four years ago, for reasons inscrutable, they changed the hinges from being on the left side of the door to the right side of the door. Obviously, you now have push the other side of the door to open it. To this day, I still push on the wrong side. I push and push, then remember to change sides. I never seem to learn. Even monkeys learn. Even the undergraduates learn. Still, I push away on the wrong side of the door. It's quite frustrating. One day, the porter laughed and said, "It's only you and the old duffers that can't remember." So, I think senility is kicking in early. The way I see it, this gives me ample opportunity to forget things that I don't want to remember without fear of recrimination. After some rifling through old e-mails and spreadsheets, it turns out that I bought this pair of Changtai cakes (shown below) by proxy, from a generous travelling friend who was kind enough to allow me to buy some cakes through him (thanks again!). They arrived with a bunch of other teas, which I enjoyed during last year, and then my thesis burden landed on me. and squashed my free time. These cakes, and one or two samples, quietly made it into our tea collection but have not yet been enjoyed. I like Yichanghao - it's always a good brand. Changtai are a great producer, mostly sold by Houde in the west, and are responsible for one of my favourites, the 2005 1st Pu'er Trade Fair. I'd be delighted if more vendors sold Changtai products (and Yichanghao in particular) - why are they so rare? They're generally very good without attracting the almost unethically large price tags of brands such as Xizihao. Maybe we'll see some more Yichanghao in 2009! As I'm sure you know, "Yichanghao" is that typical Chinese combination of two characters used to show the conjunction of two concepts; in this case, it is the combination of "yi" from "yiwu" and the "chang" from "Changtai", making this the "Changtai-Yiwu" brand. I think neipiao [inner tickets] are becoming more mature. The Yichanghao version, shown above, describes the nature of the tea and makes absolutely no claims to curing cancer, helping you to win the lottery, or bringing about lasting peace in the Middle East. The cakes (pictured below) are real beauties. 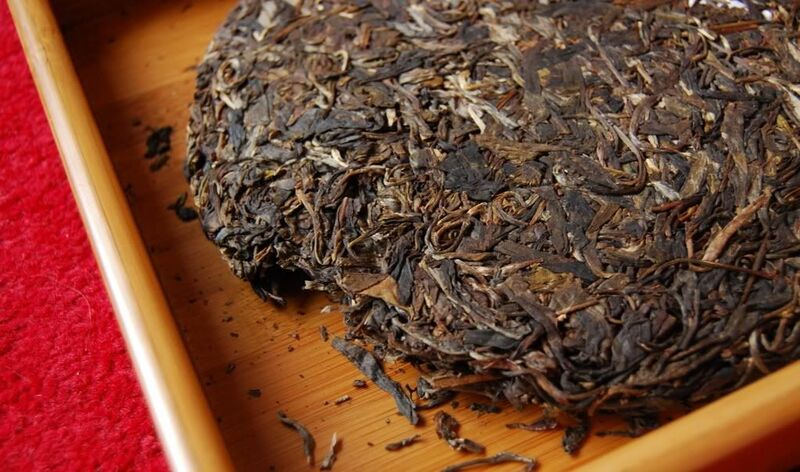 The Yichanghao approach uses large fragments of leaves, which gives the cake a pleasing homogenous character, and no doubt equalises the contribution from small and large leaves alike in the blend. There are definite benefits to chopping leaves. The hand-pressed cakes come apart easily. 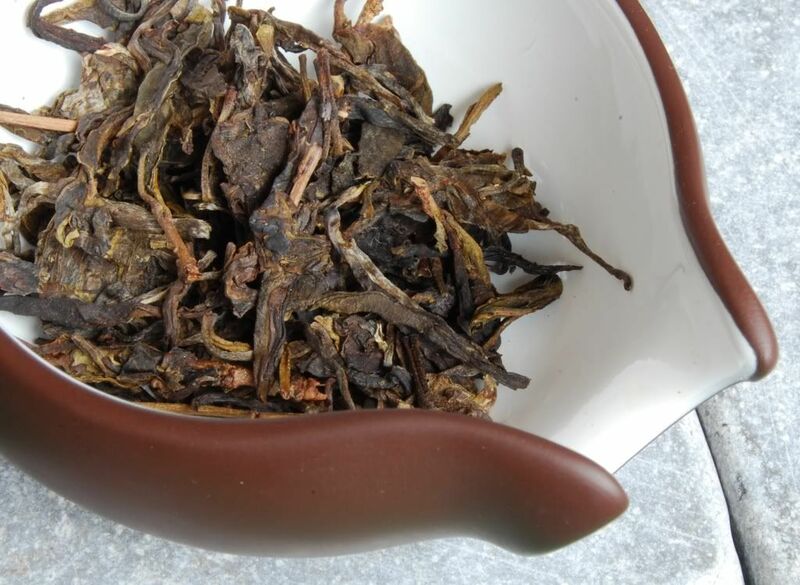 The leaves look a wee bit dark, and yet the aroma is orthodox Yiwu sweetness. While the soup comes out a solid orange, in correspondence with the darkness of the leaves, it is crisp and clean, and the aroma is sharp and sweet. If I were to boil down some lovely cedarwood shelves and drink the result, I would have this tea. 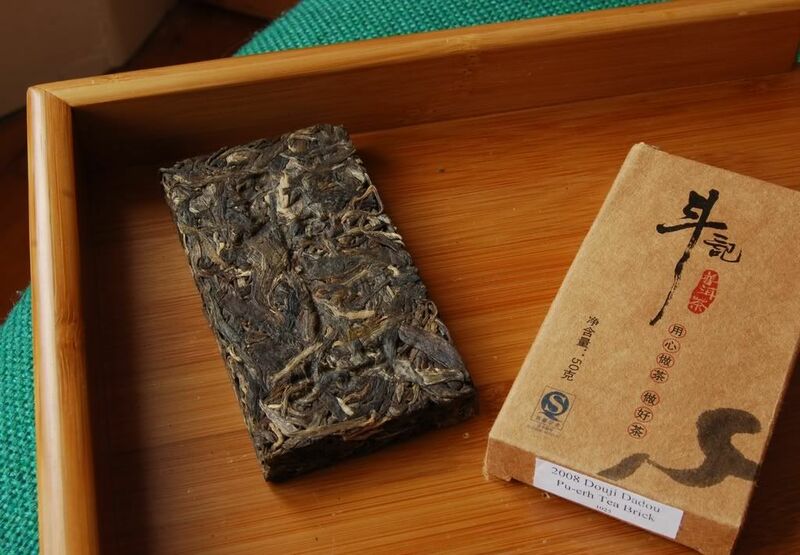 It is full of youth and energy, yet has a rich, low, woody tobacco character that dwells wonderfully in the yunxiang [the after-aroma that sits in the nose]. Unlike many tobacco teas, this one has retained its bitterness, and isn't afraid to deliver a full, bitter tang in the finish just to remind you who's boss. A wisp of wood-smoke makes me happy. These are good cakes, and I have absolutely no idea how to go about getting more, short of taking an early trip to China. Later infusions open out into a rugged sweetness - I think of rustic honey, the kind that our bee-keeping neighbours used to provide back in my home town. I always thought being an amateur beekeeper would be a lot of fun, plus you could tell people that you were an apiarist. The chaqi of this tea simultaneously wakes me up and calms me. What a fine thing this is. People of the world, rise up and demand more Yichanghao! This has long, unbroken leaves and "hand-made" compression. The dry leaves have no scent at all, although they have been sealed in plastic for five years: while I have two cakes, I am drinking the remainder of my original sample, today. This is a heavy, yellow-orange pu'ercha with a good, solid core of sweetness. There is a straw-like characteristic, and it lasts well after swallowing. Even aging while sealed in plastic, changes may be determined. The sweet rough-straw of the body is challenging, and keeps the session interesting. 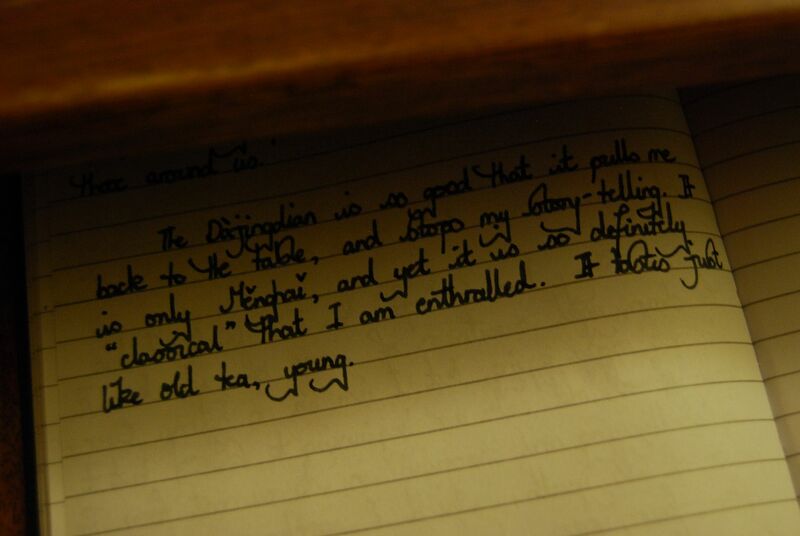 "The tea seems to last forever", my journal records. 2008 Xiaguan - FT "Baoyan Jincha"